The yearly golfing event that benefits local athletes is set to tee off Saturday morning. 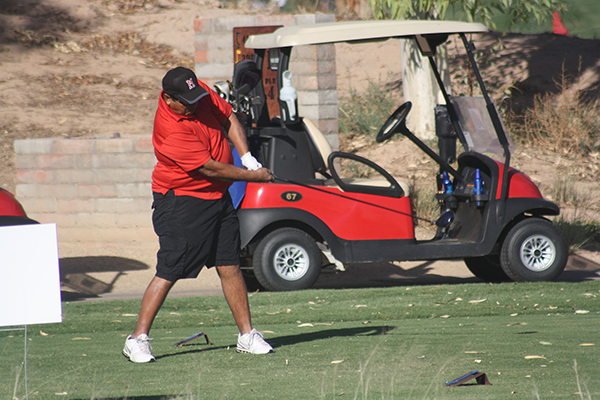 The eighth annual Maricopa High School Football Golf Tournament begins with an 8 a.m. shotgun start and a four-person scramble at Ak-Chin Southern Dunes. The registration fee per person is $125, and $500 per foursome. Mark Rasmusson, MHS Football Booster Club president, said the money raised goes toward equipment, trips to football camps and meal planning. The cost of meals alone each season is over $10,000. “Every game-day we feed each team: the freshmen, JV and varsity; Along with varsity also every Thursday night before their games, so we are providing four meals a week basically,” Rasmusson said. The booster club hopes to raise between $18,000 and $19,000 Saturday. A variety of prizes are offered in the general tourney, including additional prizes for long drive, closest to the hole, and a $5,000 cash prize for a hole-in-one on hole No. 17. Rasmusson said the event helps provide equal footing for Maricopa football players who play in a large division but live in what still feels like a small town. “For our kids, sometimes there is a stigma about Maricopa, and we’re trying to provide the kids the same opportunity that every other kid in the state has,” Rasmusson said. Participants have until 7:30 a.m. the day of the event to sign up. To register visit the Maricopa Rams Football Facebook page.